We bid farewell to Port Vila, Vanuatu on the evening of 13 October, but Port Vila did not want to let us go. 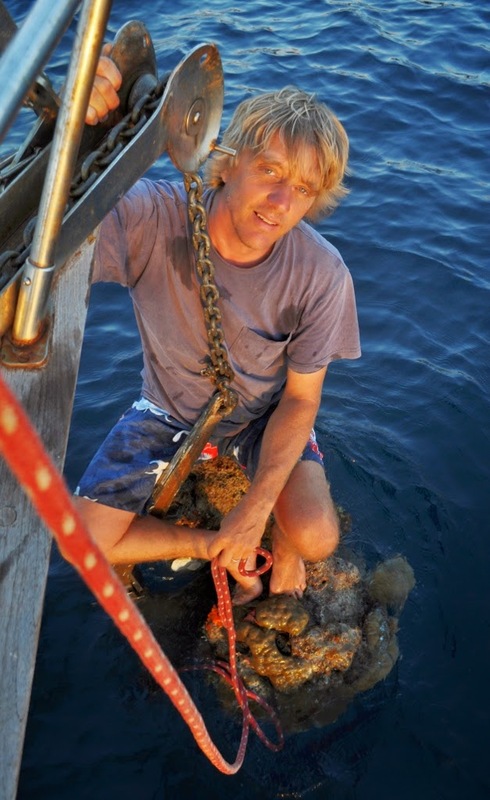 We sailed off the anchor only to discover that the CQR was balancing a hefty chunk of rock and coral on its tip. There was no way to knock it off, so we had to tuck behind an island and climb out onto the anchor to attach a line to the anchor crown. We then dropped the anchor again so that it hung from the crown, which released the anchor from the rock. This sort of thing doesn't happen very often, so we felt the need to take a picture. 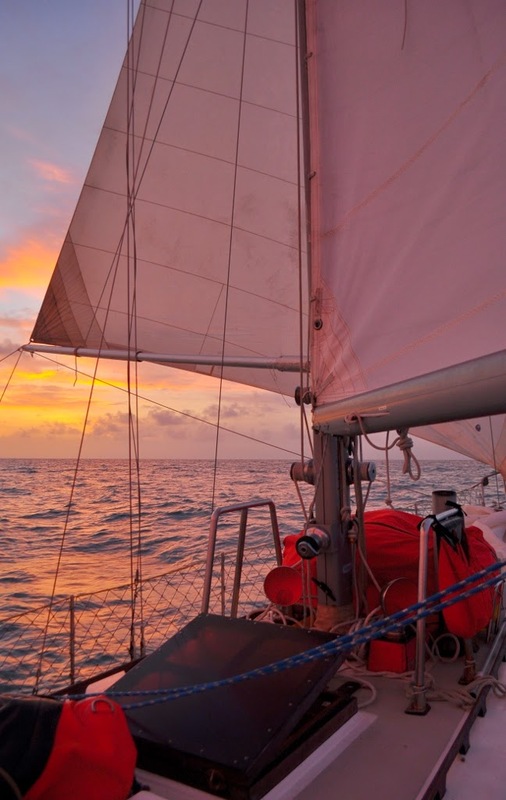 The conditions for the passage to the Torres Strait were quite good; we sailed most of the way with the wind from behind, the mainsail reefed, and the jib and staysail lying on the foredeck. However, four or five days into the passage, Jerome started to complain ever more loudly. Jerome is the name of our windvane self-steering gear; we started calling him Jerome soon after his installation. I named him after the patron saint of travelers, St. Jerome -- who, it turns out, is not the patron saint of travelers at all but rather a grumpy old man most famous for going off on heretics. My mistake. Jerome's main bearing -- consisting essentially of a fiberglass tube -- had deteriorated; this was not a new problem but one I thought I had fixed. So one morning at the crack of dawn when conditions were good we hove to and hauled him into the cockpit for surgery, which lasted the better part of the day. This sort of thing doesn't happen very often, so we felt the need to take a picture (it should also be said that filing and sanding epoxy/fiberglass while dressed only in underwear is not the wisest maneuver). In point of fact, there aren't that many things to photograph when you're on a passage -- parts of the boat, other parts of the boat. 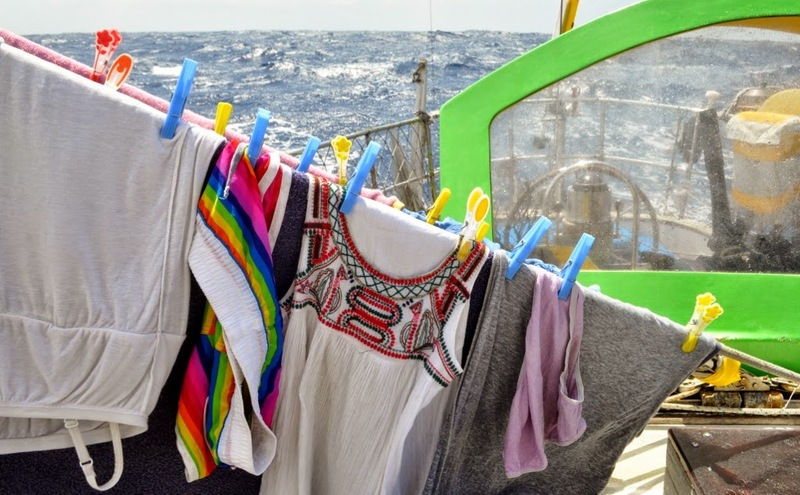 So we took a whole series of pictures of our laundry hanging out to dry on the mainsheet. 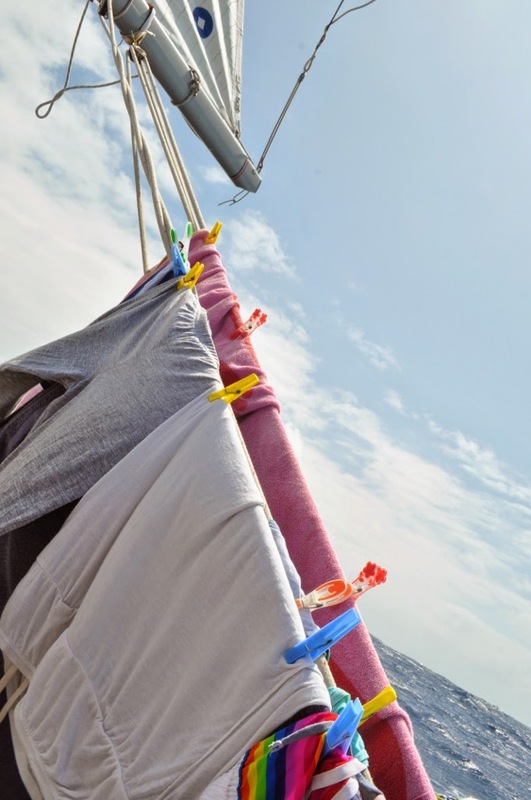 We seldom experience conditions so predictable that laundry can be dried in this manner, thus the taking of these photos in particular was overdetermined. 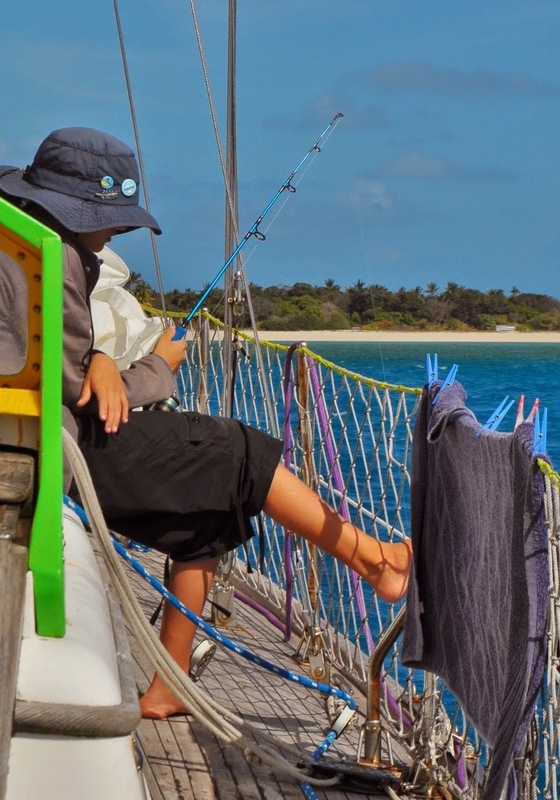 We arrived at the top of the Torres Strait on the morning of 25 October, our twelfth day out. Spotting the tower on East Cay some five miles away reassured me that the GPS still worked, because I sometimes entertain the thought that where we are in our small virtual electronic world may not bear any relation to our place in the larger scheme of things. Jerome was once again giving us problems, but this time we were able to anchor in the lee of one of the islands and take our time. It took a little more effort to get him into the cockpit this time (I didn't have to go over the side when we were at sea). Over the course of two days we took him apart, made an entirely new bearing, and put him back together again. It's a learning experience and looking back more than 1000 miles later it appears as if we have the problem under control. 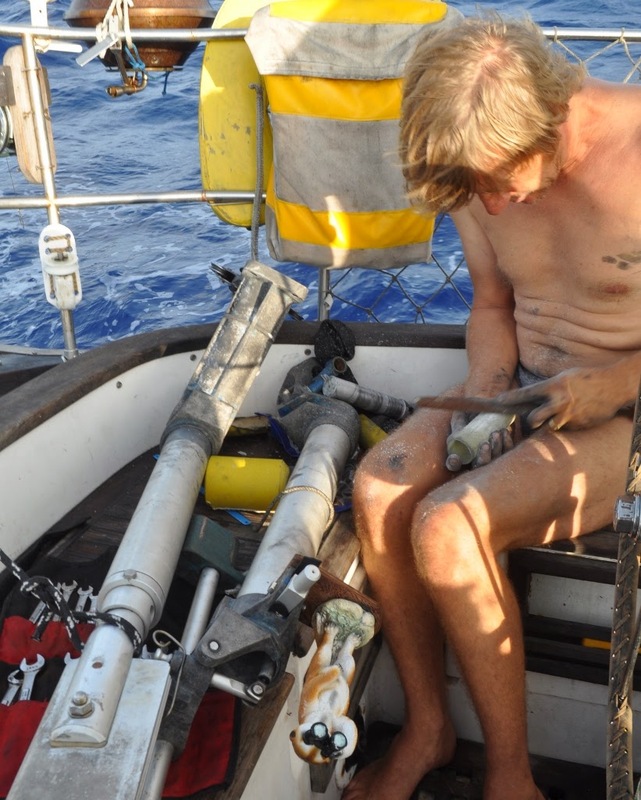 This sort of thing doesn't happen twice on a passage very often, so we felt the need to take a picture (it should also be said that filing and sanding epoxy/fiberglass while dressed only in a pair of shorts is not the wisest maneuver). The fact that the Torres Strait is a shallow stretch of water strewn with islands and shoals through which two immense bodies of water exchange their fluids filled me with a certain degree of trepidation. 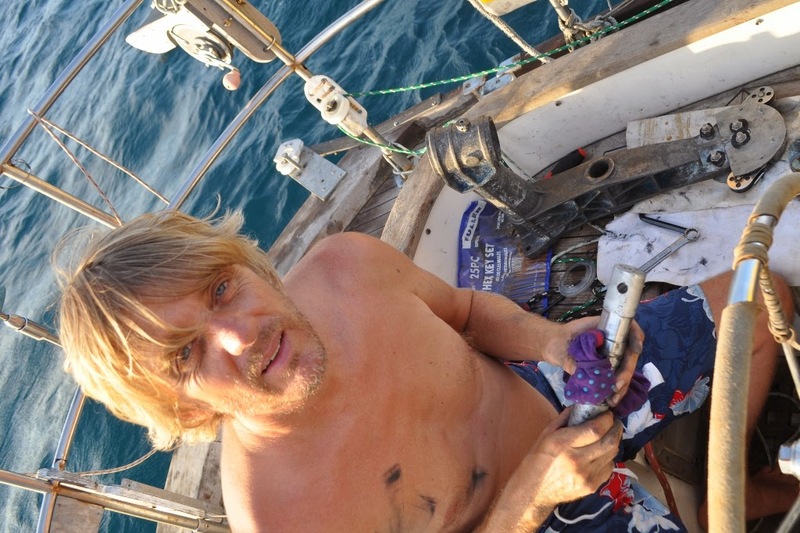 But our conditions turned out to be wonderful -- incredibly blue water, strong winds, and sheltered seas. On our way south we anchored overnight for a second time. And as we passed Friday Island heading into the Gulf of Carpentaria, we saw a huge bag of trash transmogrify into mating turtles. This sort of thing doesn't happen very often, but we were too slow with the camera. Naturally, we celebrated our transit of the Torres Strait with a double batch of brownies and french onion soup. But the rituals in preparing this holy feast were not properly followed -- i.e., do not use bad eggs; do not eat raw batter. And thus the priestess was struck down with great vengeance. Michelle disappeared into our bunk with salmonella poisoning for most of what remained of our passage (some 800 miles). Salvation came in the form of Cipro, which gave her hallucinatory dreams and eventually brought her back to us. This too doesn't happen very often, but I didn't have the heart to take a picture of Michelle lying on the floor next to the toilet cradling the stainless steel vomit/ popcorn bowl. 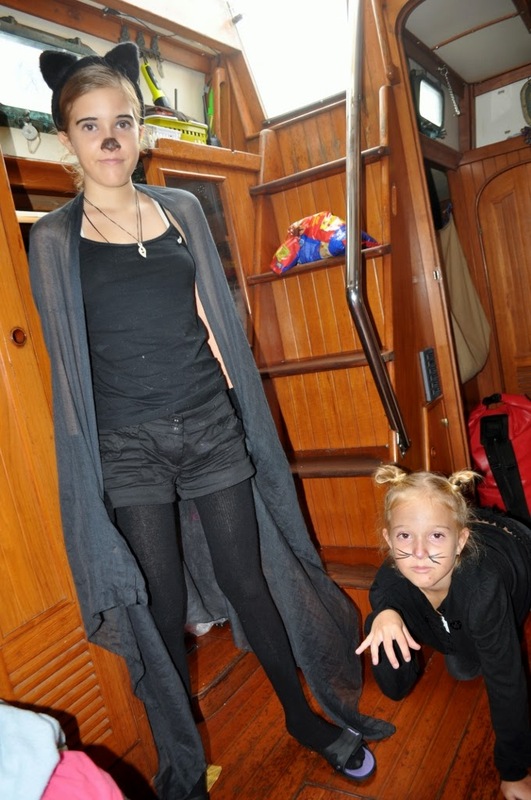 We do, however, have a photo of Lola and Jana on Halloween, which was celebrated in the morning for about ninety minutes without any trick-or-treating. 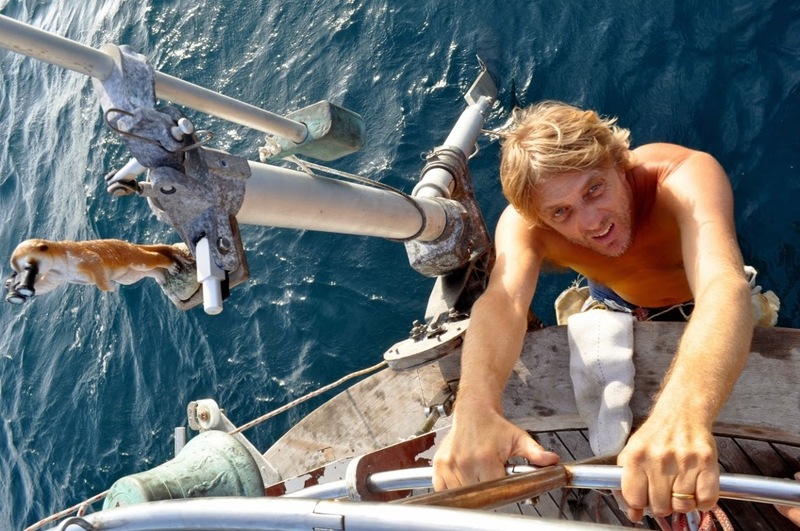 The sailing itself was gentle and smooth, the shallow waters of the Gulf of Carpentaria giving way to those of the Arafura Sea, which were also quite shallow but incredibly black. 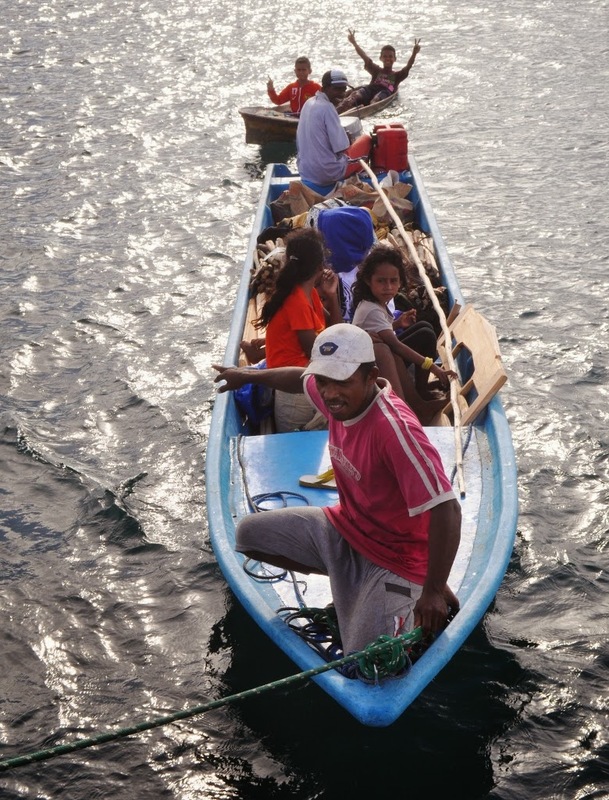 At dusk the sea would suddenly become an obstacle course dotted by the peculiar red-blue-green flickering LED "navigation" lights of small Indonesia fishing boats and drifting fishing lines (or nets -- I couldn't tell). At one point as I watched from the companionway, the boat -- moving slowly yet inexorably -- crossed a line shimmering green with phosphorescence stretching on either side to distant flickering buoys. I held my breath, but the line was undisturbed and thus must have been at least two meters below the surface. We finally arrived in Debut Indonesia on 3 November, twenty-one days after leaving Vanuatu. Just outside the entrance we took in tow a family in a small boat with a failed motor. Arriving in an entirely new place after spending time at sea -- in this case a place dotted with mosques, teeming with friendly people we could barely understand, and crisscrossed by long narrow boats powered by percussive lawnmower engines with long propeller shafts hung over the side -- is always electrifying. 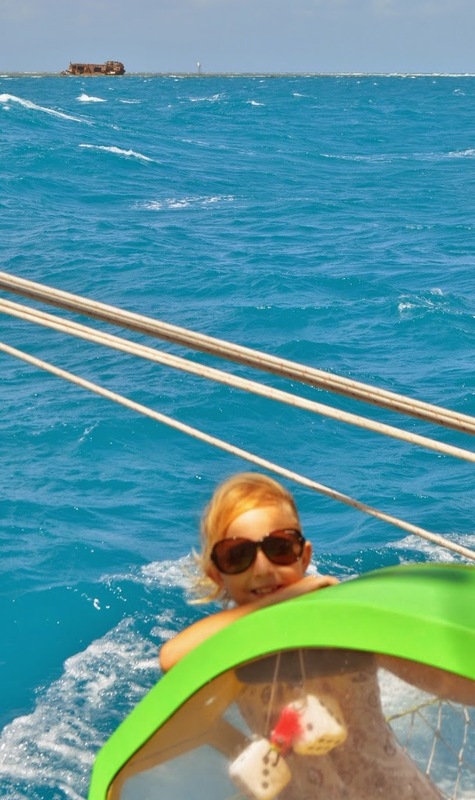 After we dropped anchor and engaged in a lengthy but incomprehensible exchange of sounds with the stranded family, we lent them our dinghy oars. And they promptly brought them back, which nicely set the tone for our sojourn in Indonesia.